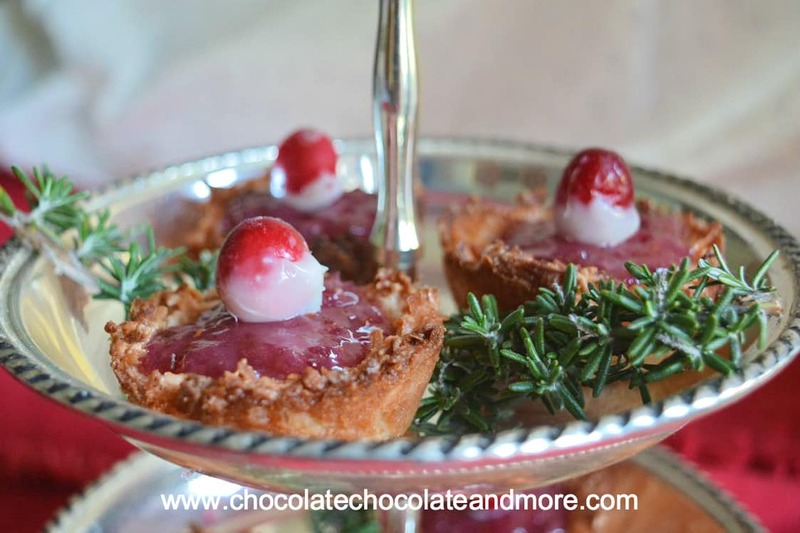 Cranberry Macaroon Tarts - Chocolate Chocolate and More! 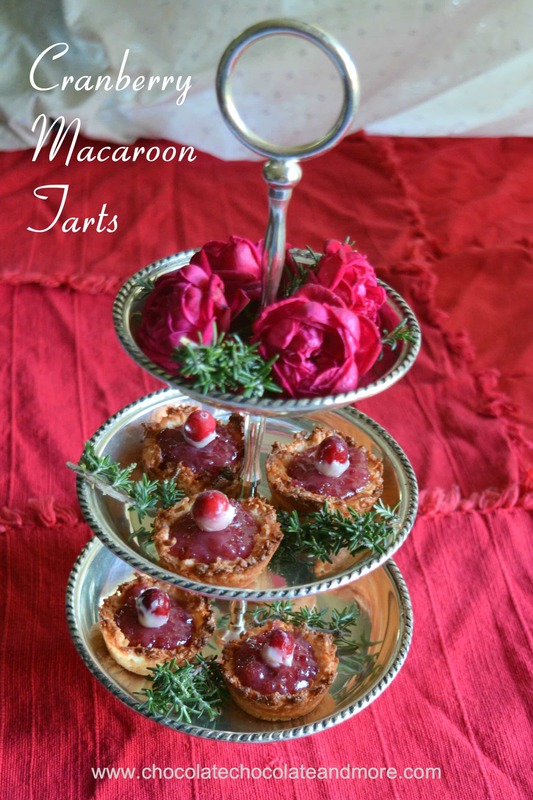 Cranberry Macaroon Tarts – Macaroon tart shells with tart cranberry filling make an easy to serve, elegant dessert. Today is a dreary, rainy day. It’s not raining hard but it’s cold and wet and not something I want to venture out in. The problem is, it’s supposed to be like this for the next five days so I’ll have to go out eventually. In the meantime, I’ll make some things with ingredients I have around the house. As you can see, I’m still using cranberries from Thanksgiving. I like to buy lots while they’re available and keep them in the freezer all year but I can’t resist using them while they’re fresh. The macaroon tart shells in these cranberry macaroon tarts are great with many different fillings. You can fill them with chocolate pudding, lemon pudding, cream pie filling. The list goes on. They’re also easy to make. Just mix the ingredients and press into greased muffin cups. The macaroon tart recipe doesn’t make enough to go all the way up the sides of a standard muffin cup so the tarts are not deep. They’re about half as deep as the muffin cup. This is perfect for several tablespoons of filling and that gives a nice balance between the macaroon and the filling. I garnished my cranberry macaroon tarts with cranberries dipped in some white chocolate from Santa Barbara Chocolate. I simply melted a little white chocolate in a small bowl and dipped the bottom half of some of my frozen cranberries into it. The chocolate solidifies very quickly on the frozen cranberries so you can just put them on waxed paper to harden. You could also garnish with sugared cranberries or a little whipped cream. These also keep very well in the refrigerator. I made these a week before I had time to photograph them. So you can make them ahead of time for holiday parties. Grease a 12 cup muffin pan. Combine macaroon tart shell ingredients in a bowl. Divide mixture evenly among the 12 muffin cups. Press mixture into bottom and sides of the muffin cups. The mixture will only go about half way up the sides. Bake at 400°F for 15 minutes or till edges are browned. Cool 2 minutes in the pan before removing to cool on wire rack. While the tart shells are baking, make the filling. Combine sugar, cornstarch and orange rind in a saucepan. Gradually add water. Stir with a wire whisk until well blended. Bring to a boil over medium heat. Add chopped cranberries and cook for 1 minute. Gradually stir ¼ of the cranberry mixture into the beaten egg. Then add the rest of the cranberry mixture. Cook over medium hear stirring constantly until thickened (about 1 minute). Put several tablespoons of filling into each tart shell. Top with whipped cream or a cranberry dipped in white chocolate. Thanks Asiya. I hope you enjoy them! This dish will surely be perfect for any occasion. Desserts are always loved by everyone when best served with something chocolate. These look lovely, Gail! And with no dairy, they are perfect for my lactose-intolerant friends. I may make them for a party next weekend. Didn’t even think about them being dairy free. I’m guessing you could substitute coconut flour for the flour to make them gluten free. Hope you and your friends enjoy them!